Providing you the best range of cyclone separator with effective & timely delivery. Diffused cyclone dust extractor are different from ordinary ones: one is to have a cone shape of the hypocone; The other is to have reflector screen in the bottom of the cone. There are some characteristics, such as high efficiency of dust removing, simple and compact structure. Applicable to capture dry, non-fibrous dust particles. 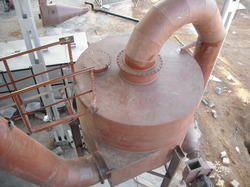 Looking for Cyclone Separator ?